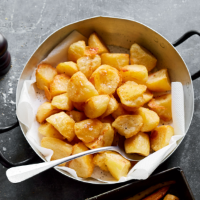 This is the only recipe you'll need to make the perfect roast potatoes, ideal for serving with Sunday lunch or Christmas dinner. 1. Preheat the oven to 200°C, gas mark 6 and heat up a large roasting tin. 2. Bring a large pan of lightly salted water to the boil and parboil the potatoes for 5 minutes. Drain in a colander and leave to steam for 5–10 minutes to lose some moisture. Meanwhile, put the goose or duck fat in the hot roasting tin and return to the oven. 3. Roughen the edges of the potatoes, either by scraping with a fork or tipping them back into the pan and giving them a bit of a shake. 4. Remove the tin from the oven, tip in the potatoes and turn them over carefully until evenly coated. Make sure they have plenty of space to brown properly. 5. Return to the oven and roast for 40-45 minutes until crisp and golden. Drain the potatoes on kitchen paper, season and serve. Par-boil the potatoes the day before, cool and keep covered in the fridge until ready to cook. If you are using this recipe for Christmas day, put the potatoes into the oven as the turkey starts resting.